AVOC sources have reported that an elderly lady affiliated with a local newspaper was involved in an auto accident involving a bicyclist on Monday, October 24, 2005. Apparently, the elderly citizen was headed North on GA 53 and attempted to turn left in the vicinity of Publix Shopping Center . She allegedly turned left in the path of a bicyclist headed south on GA 53. The bicyclist reportedly is a 40ish Oconee County Minister. Reports say the bicyclist was thrown over the hood and landed on his head- thankfully he had a helmet. He did sustain injury to a knee that may require surgery. AVOC understands that emergency personnel came to the scene. AVOC does not know if any police report was made or if any charges were filed against the elderly lady driving the automobile. County Passes on Land Acreage Opportunities Adjacent to Oconee Courthouse Complex? In the last couple of years, two long-time residents of the Water Street "Courthouse area" have died. Their estates have signs indicating real estate is for sale. The two estates own all the frontage on Water Street from the Courthouse to Durham St behind Oconee State Bank. AVOC has been told that the County has declined to buy the properties. AVOC understands there is close to 9 to 12 acres in the two tracts. The County badly needs more space around the courthouse. A courthouse has to be located in the County Seat by law- in the City of Watkinsville . As one who diligently looked for a Fire Station lot and other facilities for a number of years, I know that the availability of land is rare - almost a generational thing. The County should buy this land. It is and will be needed. I do not know if the County is too much committed financially on the New Park and the New Jail, or someone thinks they will just go outside town and build a "big complex". That is bad either way. Investment in this land will serve the county a lot longer than the New Jail (some near future Sheriff will want to replace the new one) and New Ball-fields. There needs to be more vision and longer range planning and thinking on the part of the County Commissioners . AVOC Sources have indicated that Gober Road- Price Mill Road area now may not be in the running for the new elementary school in lower Oconee County . That is good. 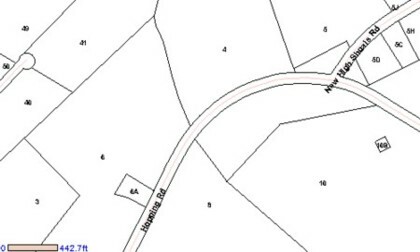 Sources say that Astondale Road and Hopping Road (GA 186 in High Shoals) are in the running. Astondale seems to be close to Colham Ferry Road School but time will tell the facts. 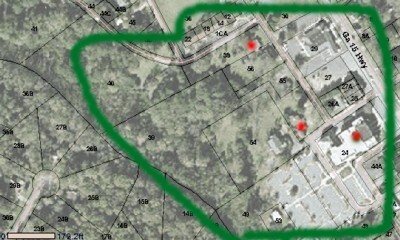 Property records research have not revealed any Developer owned tracts in either area. However, options etc are not always known. Negotiations are always confidential for obvious reasons. However, it is not unlikely that developers, banking officials and those connected to the Development industry are "on top of the process". Once the site is announced and purchased, closer analysis of owners, price and nearby owners will be scrutinized. Prices for the site chosen and the competing sites will become more publicly known and citizens can consider some of the factors entering into the decision..
Hopefully, students and citizens are the real winners in a new school decision. 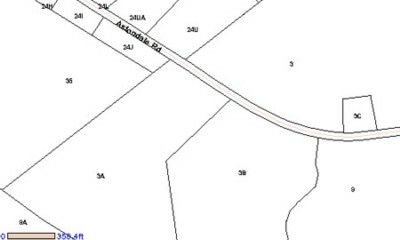 Astondale Road Area Just Outside Bishop- Bishop and 441 are to the left on map. Hopping Road in east High Shoals. High Shoals and Apalachee River (County line) are to the lower left on map. 10-10-05 Oconee County Schools Are "Thinking Big" - Too Big? LAWRENCEVILLE - A lawsuit involving the deaths of three people crushed by a giant billboard that collapsed â€¦â€¦ has been settled for $2 million, lawyers for the plaintiffs said Wednesday. The suit was filed in Gwinnett County State Court against Trinity Outdoor LLC of Buford and Phoenix Structures & Services Inc.
Trinity Outdoor is owned by Morgan Hudgens, and the company's Web site noted he moved to Athens in 1992, founded another billboard company, Diamond Outdoor, with his father, state Rep. Ralph Hudgens, R-Comer, and three years later founded Trinity Outdoor with a different partner! Oconee County Moves Welcome Center From Main St. to Side Street By Wendell Dawson, Editor, AVOC, Inc. In the late 70's, the State Department of Historic Sites decided to close the Eagle Tavern as a State Historic site. At the time it was offered to the County for operation. The county has operated it since. At times, it was a co-op arrangement with the Chamber. It is an interesting facility with a lot of local history and legends. It is old and hard to heat and cool. We did several things to promote its use in my years as Chairman. Recently, the County has decided to move the "Welcome Center" from the Eagle Tavern to a building owned by the Chamber on GA 53 at Water St. Sources have told AVOC that the county is paying the Chamber $ 700 a month as rental on the current location and the Eagle Tavern is only shown by appointment. One wonders how the current site (old house) is superior to the Eagle Tavern Site. It seems that some of our officials have little interest in our history. There seems to be a lack of interest in preserving the quality and way of life many of us have known. Eagle Tavern of Watkinsville, . IN THE TOWN OF WATKINSVILLE, . The land on which the hotel was built was originally granted by Governor Edward Telfair to Josiah Woods and Roderick Easley of Franklin County , Virginia , in the year of 1791. It changed hands and was sold from one to the other until the year 1836. Richard Richardson acquired the land by a deed dated October 27, 1836. Watkinsville, the county seat for the original Clarke County , 1801, was a cross roads of travel to Athens from Madison and Greensboro . By 1815, this sea of justice of a growing frontier county had a courthouse, a jail, and by necessity, a tavern. The town was only seven miles from the newly founded University of Georgia in Athens , and until 1831, Athenians had to travel to Watkinsville to vote in state elections. By 1827, Watkinsville had a clerk's office, four stores, and twenty houses. In 1837 stages departed Milledgeville bound for Athens three times a week. This route certainly brought more trade to the Eagle Tavern. An outdoor kitchen was built in 1830. Soon after, additions to the original building were begun. Twelve rooms were added around the original Eagle Tavern. The oldest section of the building, which is of plain style, has been restored. Separate doors lead into the two rooms on the first floor. One door enters the tavern, and the other a store and trading area. Many people tried to buy the old Tavern before the late Lanier Billups, of Decatur, Georgia, bought it in 1934 to prevent it from being torn down to make way for modern building. In 1956, Lanier Billups, a descendent of one of the Eagle Tavern's owners, deeded the historic sixteen room hotel to the Georgia Historical Commission. The dilapidated Eagle Hotel, cited in 1933 by the Historic American Building Survey as an example of fast disappearing early American architecture, had been an important part of life in Watkinsville for so long that its actual history has become largely folklore. While almost all taverns and stage stops disappeared, Eagle Tavern survived as a representative historical setting. Much of what happened in and around Watkinsville for the last 150 years had come to be associated with the venerable Eagle Tavern. The years prior to the Civil War were the busiest for the tavern. Following the war, activity at the tavern decreased for numerous reasons. Few stages traveled the poorly maintained roads in proportion to wagons, sulkies, carts, and people on horseback. 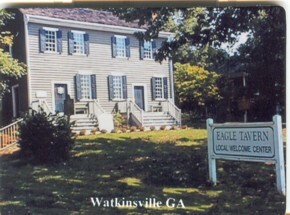 Travelers of all sorts came into town, served by a combined bar, store, eating, sleeping, and meeting place like Watkinsville's Eagle Tavern. A meeting was held in 1785 to select the site for the University of Georgia which was opened in 1801. Oconee County was created out of Clarke County in 1875. Richard Richardson, who bought the property in October 27, 1836, died in 1871. His daughter Martha and her husband Edward Swepson Billups ran the tavern for several years. However, after the expansion of railroads, the decline of the plantation economy, and the shifting of Georgiaâ€™s capitol to Atlanta, all meant less business for the Tavern Hotel in the Eastern part of the state. The Georgia Historical Commission, through the restoration and furnishing of the earliest section of the building, and by the means of exhibits such as the 1825 Eagle Tavern travel map, continues to perpetuate Eagle Tavern as a representative historical setting for a way of life which was long past. The two rooms upstairs were bedrooms. There were, in each room, three beds. The travelers slept in their clothing and most of them in their boots. The ladies did not travel in these days unless it was a case of emergency. The most distinguished guests slept in the beds. When the beds were filled, the bartender would let the men bring in their quilts and sleep on the bar room floor in exchange for whiskey. The initial entry was 87 cents, for dinner and horse feed. The furnishings that have been placed in the Eagle Tavern are not original, but date back to that period. Before the kitchen was added in 1800, the food was cooked on the fireplace in iron pats hung on large hooks. The food was served on a table in the bar room. The stage coach driver had a horn that he would blow when he got to town to let people at the tavern know how many passengers he had. He would blow the horn as many times as he had passengers, and by the time they arrived at the Eagle Tavern the food was already on the table and ready for them to sit down and eat. The dry well underneath the house, in the basement, was the refrigerator that they used. It was 14 feet deep. They had wooden steps that would take them down into the well to place the food there to get cool. The store room or trading area is where they came to buy their sugar, coffee, spices, and things that could not grow in this section of the country. The bar was where the mail was given out and the whiskey was served. At night, the bartender would lock the window and door to keep the men who were sleeping on the floor out of his drinks. At that time, "hot ale" was one of the most popular drinks. The mug would be filled with ale, the poker stuck in the fire and heated until it was red hot. Then they would stick the poker in the mug. That is how the ale was heated. The water that was used at the Eagle Tavern was brought from a spring some distance away. The spring was known as Kindellâ€™s spring at the time. Carved in the wilderness, the town of Athens came into being, and a site of â€™s first Chartered State University . The college did not open its doors until 1801, when the first class was conducted underneath great oaks with curious Cherokee Indians. Athens was then the farthest north of any town in and those were its nearest neighbors. Watkinsville, a town near Athens was originally considered as a site for the State University but was turned down because it was feared that there may be a disrupting influence to students. The University was first known as Franklin College .